Patients treated with trastuzumab for HER2-positive metastatic breast cancer (HER2+MBC) are living longer, but there is little information on their outcomes and treatment experience beyond the median survival from clinical trials and real-world observational studies. We aim to describe the real-world treatment patterns and overall survival (OS) for women surviving five or more years from initiation of trastuzumab for HER2+MBC. 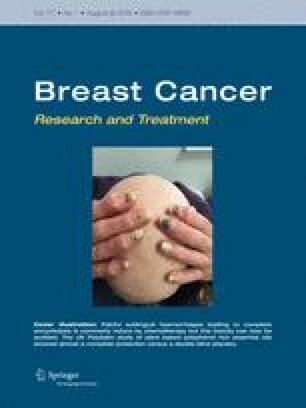 This is a retrospective, whole-of-population cohort study of women initiating trastuzumab for HER2+MBC between 2001 and 2011, followed to 2016. We defined long-term survivors (LTS) as those patients surviving ≥ 5 years from trastuzumab initiation. We used dispensing claims to describe timing of cancer treatments used by LTS and to estimate time on and off HER2-targeted therapies, and OS from trastuzumab initiation for HER2+MBC. Of 4177 women initiating trastuzumab for HER2+MBC, 1082 (26%) survived ≥ 5 years. Median age for LTS was 54 years (IQR 46–63). At a median follow-up of 9.4 years, 36% of LTS died; their conditional probability of surviving an additional 5 years was 55%. Median time on trastuzumab and all HER2-targeted therapy was 58.9 months (27.6–88.1) and 69.1 months (35.6–124.5), respectively. 85% of LTS had a period off HER2 therapy, lasting a median of 30.4 months (8.2–NR). LTS generally receive HER2-targeted therapies for periods of time longer than in clinical trials, but most LTS also had breaks in treatment. More research is needed to understand the effects of long-term treatment and to identify patients who may be able to safely discontinue HER2-targeted therapy. The online version of this article ( https://doi.org/10.1007/s10549-018-4804-0) contains supplementary material, which is available to authorized users. We acknowledge the contribution of Sally Crossing (AM) (1946–2016) as the Health Consumer Advocate on this research program. We thank the Department of Human Services for providing the data for this research. This work was supported by a Cancer Australia Priority Driven Collaborative Support Scheme (ID: 1050648) and the NHMRC Centre of Research Excellence in Medicines and Ageing (CREMA; ID: 1060407). BD is supported by an NHMRC Postgraduate Research Scholarship (ID: 1094325), the Sydney Catalyst Translational Cancer Research Centre (no grant number), and a CREMA PhD scholarship top-up (no grant number). NH receives funding through a National Breast Cancer Foundation (Australia) Breast Cancer Research Leadership Fellowship (no grant number). BEK has received conference support and a speaker’s honorarium from Roche. RLW is a member of the Pharmaceutical Benefits Advisory Committee (PBAC) and SAP is a member of the Drug Utilisation Sub Committee of the PBAC. The views expressed in this paper do not represent those of the either committee. The remaining authors declare no conflicts of interest.